There’s no denying that. Just look at the huge variety of combinations available when you order. To start off, there are six different wing sizes and types of chicken alone: three non-breaded and three breaded. The non-breaded include the so-called university wing, a leaner chicken limb, where you get 16 or so in a pound. 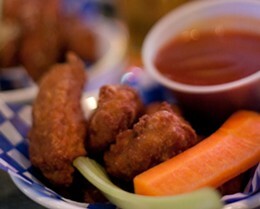 Also non-breaded is the original---more like 10 per pound---and the hot and spicy wing. In the breaded category you’ll find the mega wing---perhaps taken from the chickens you see pumping iron at the gym on a regular basis, garlic breaded wings and the popular boneless edition: breaded white meat. Add to the wings 10 dry rubs, including sea salt and pepper and Cajun flavours, and 60 sauces---available on the wings or on the side---that include Frank’s RedHot Gold Fever and Buffalo Sauce, as well as in-house flavours Maple Barbeque, Honey Awesome, East Meets West, Lip-Licking (Honey Garlic/Barbeque) and Garlic Butter & Parmesan.